Kartik fell in love with Ashima the very first time he saw her. She was everything he had ever imagined in his dream girl – his angel. As their friendship blossomed into deep love, culminating into marriage, he became her teddy, her confidant and an eternal support. But in trying to be with her, Kartik made a choice that broke his father’s heart and hopes. As Kartik and Ashima gear up to step into the next Phase of their relationship, life seems like an overload of joy and love. He is confident his love for Ashima will win over all odds, even his father. Little did he know that things were going to change drastically, forever. Why does Ashima marry someone else? Why does Kartik accept it silently? And why is life so unpredictable? This is a story of deep love that knows no bounds, relationships that break all barriers, and a promise – I am always here with you. I would like to thank the author for the review copy. My review is totally unbiased and honest. First and most author has done a fantastic job in expressing his story in right path. At the start you will see Kartik feels sad while seeing her wife getting married and it is for the ‘Obvious Reason”. After which the flash back starts and I was attached to the first half of the story that I totally forgot that obvious reason.I felt defeated when the tragedy happened. I liked that part in the book. The charm of the first half was missing in second half. At times only the flashback inside flashback saves from boredom. An intelligent book where author balanced the illogical facts with his Pre-mention of the further story. With that mention you will no longer feel odd. This book has too much love emotion flowing and you will surely dive in but be prepared for the major fall. You will be weakened at one point for sure. Love is what we feel than what we see. The plot and the narration too felt the same way. You might feel exaggerated at times but the family are meant to be that way. They get angry for small things and breaks down way too for. But when you need them they will be there for you.That scope was beautifully expressed in this novel. This book is a quick read one. I wouldn’t say that it is perfect for romance lovers but you could definitely pick this book if you want to have and feel the deep pain of love. This book will interest you truly on your mood level. 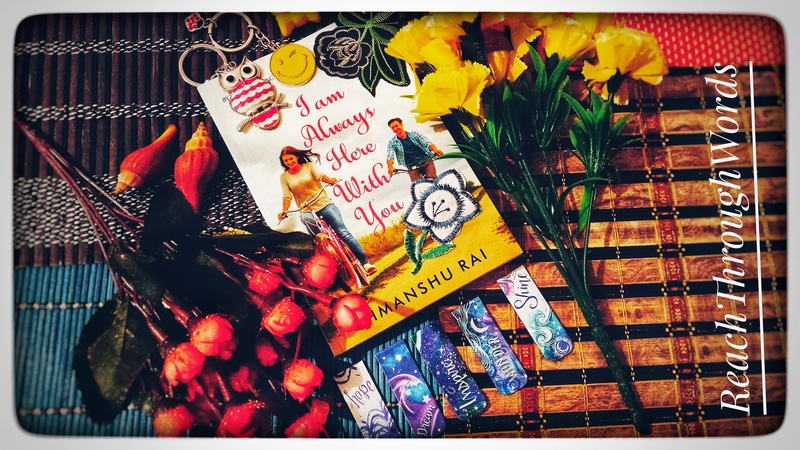 ” I am Always Here With You” is a blend of romance and love with a heartbroken backdrop which might pull you inside at some points. Himanshu is a telecom professional with a passion for storytelling. His previous three novels were highly appreciated. He loves writing and tries ,anabling the readers to visualize what he writes. His book My Mute Girlfriend was based on his life-story and was one of the best romance titles of the year 2018. He lives in Noida with his wife and son.